"And the wind upon its way whispered the boughs of May, And touched the nodding peony flowers to bid them waken." Siegfried Sassoon. And awaken they are at last. Welcome to the peony season! Their season is short, six weeks or so, and gorging on them when you can, is definitely the best solution. If you choose a florist who works seasonally as I do, then expect peonies to star in your arrangements during these May and June weeks. Its a huge pleasure of mine to go and see Joe Friere, our local Genuine Jersey farmer to see the land that our produce comes from, and to talk to him about what he is growing and how. I love back stories. It makes experiences more complete and gives me a greater sense of appreciation of the produce I buy when I understand the work someone undertakes to produce what is too easily taken for granted. When Joe took over the farm, in St Lawrence, there were already peony plants growing, the Sarah Bernhardt variety as pictured here, but he added another 3 vergees. In total he now has 7 vergees of peonies which amounts to approx 3 acres. Not all grown are left to the mercy of the elements and the early pickings which amount to approx 3 vergees are grown in tunnels. The Sarah Bernhardt's that Joe grows, begin life as red sticks, looking bald and uninteresting. Slowly they turn green and leafy, and the pink golf balls arrive. Many of his peony plants are over 45 years old and I understand they can last forever with " special care "given to them throughout the year. Joe does not use pesticides on them and the only chemical spray is an anti fungal. Joe sells to the local Co-op and of course to florists island wide. Joe also has an honesty box in Rue les Charrieres Nicolle, St Lawrence, if you'd like to get them direct yourself. In the early part of the season Joe will have 4 people hand picking daily and each stem is placed into boxes of 90 stems. Being the most Southerly and allegedly the warmest part of the British Isle, his are the first British peonies to the UK markets. As many as 40 boxes are shipped to the UK twice, sometimes three times a week, depending on demand. The Jersey peonies are taken to Brighton, Bristol and the famous London Flower Market to be sold. 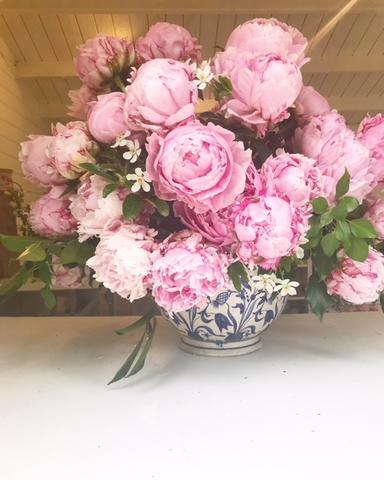 With a certain Royal wedding coming up and reading that Prince Harry and Ms Meghan Markle are putting sustainability at the forefront of their floral wishes, and using peonies and garden roses in amongst their designs, I suspect their floral designer, the fabulous Philippa Craddock may find some Jersey peonies in her hands. Well done Joe! and thank you for being the source of so much enjoyment and pleasure created by these extraordinarily beautiful blooms. Oh and please just make sure you remember to keep the 400 stems I need for next week, for the National Trust floral workshop, a hen party workshop and a 50th Birthday party. Newer PostWhat happens to all the flowers after the event? Older PostWhats in Season now?